Are you saying that the Ancient Egyptians manufactured hard stones from mineral ores ? Yes . Their Knowledge in manufacturing stones was also utilized in manufacture the stones for the sonry pyramids . What is your evidence to support the idea of man made stone blocks ? There are references to making stones on a stale , commonly know as the "Famine Stele" located on the island of Sahel , near Elephantine , south of Aswan . The Stele is dated to about 200 B.C. It is a copy of and old Kingdom text , which dates to the region of Zoser , 2500 years earlier , The three main characters on the stele , are Khnum (who represents the Divine Principle of Molding) ,King Zoser and Imhotep. 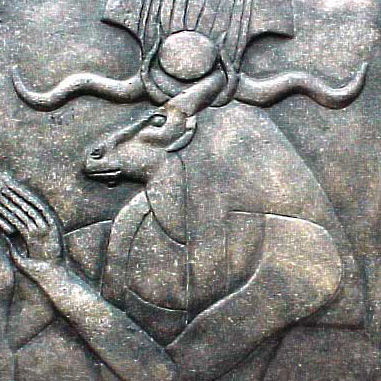 This stele should have been named Khnum's Alchemical Stele , for it holds the Key the method of manufacturing man-mad stone . Approximately one-third of this stele's content pertains to rocks and mineral ore , and their processing Columns 18 and 19 of this Steele quote the Divine Molder , Khnum , speaking to king Zoser . I am Khnum , your creator , I give toy are ore after rare ore .... Never before has anyone processed the, (to make stone) in order to build the temples ...."
Very interesting. Tell me more. 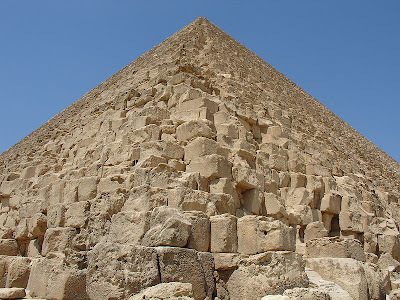 Lets up review how ancient Egypt and even some modern Egyptians make bricks , They push wet Nile mud m ,mixed with straw and sand , into a wooden moled . then the soft bricks are set out to dry in the hot sun . It must have been technological breakthrough. Not at all . They had the knowledge in Chemical and metallurgical sciences . they had been manufacturing stones for a long time as evidenced in all the tens of thousands of discovered artifacts . they limited natural stones . Their skill in complicated processes enabled them to imitate the rich brilliancy of precious stones . some mock pearls have been so well counterfeited , that even now it is difficult to differentiate , that even pearls , even with a strong lens . Pliny the Elder (AD23 - 79) the Roman naturalist ,stated in The Encyclopedia of Natural History , Book 31 , that Egyptians made Real rocks from a multitude of minerals .He also stated that Egyptians made vases from their man-made stone . So , making stones to build the Pyramids should not have been a major achievement for them . Of course not . they had been manufacturing many many other stones for along time , So making stones for the Pyramids was just a new application of their knowledge at that time . But are you saying that these stones could Not have been quarried , as we were told? 1 - copper chisels and possibly iron tools . 2 - flint , quartz and diorite bounders . 3 - large wooden crow bars . The common story also claims that to transports the stones blocks , they used wooden sledges and rollers . What is wrong with this theory ? Firstly , Because the common theory only a guess and there is no historical evidence to support it . 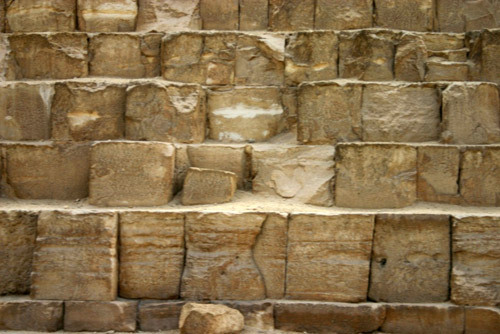 Secondly , stone and copper tools would not have been able to produce these huge numbers of blocks ,with such a Hugh quality , in the allocated tie period , here or in the other pyramids . Could it have been that they used a different method to quarry stones ? Firstly , this method results in providing irregular surfaces and not in making regular -shaped blocks .This method can only be used to reduce large pieces of sandstone ,granite , or basalt into small aggregates . Secondly , heating with fire transfers limestone into lime at 704 ْ(1,300 ْ) .As such , producing pyramid blocks by heating limestone is impossible . I believe that these blocks were high quality man-made limestone concrete and not quarried natural stone .It is a known fact that the ancient Egyptian silicosis-illuminate cement mortar is far superior to present day hydrated calcium sulfate mortar, By mixing the ancient high quality cement , with fossil-shell limestone concrete . The synthetic blocks consist basically of about 90-95% limestone rubble ,and 5-10% cement . All the required ingredient to make synthetic concrete stone , with no appreciable shrinkage , are plentiful in Egypt. 1 - The alumina , used fir low temperature mineral synthesis , is contained in the mud from the Nile River . 2 - Natron salt (sodium carbonate) is very plentiful in the Egyptian deserts and slat lakes . 3 - Lime , which is the most basic ingredient for cement production , was easily obtained by calcining limestone in simple hearths . 4 - The Sinai mines contained arsenic minerals , needed to produce rapid hydraulic setting , for large concert blocks . Natron (as type of flux) reacts with lime and water to produce caustic soda (sodium hydroxide) , which is the main ingredient for chemically making stone . Records of mining activities during Zoser's reign are indicated in a stele at the mines if Wadi Maghara in Sinai . Similar mining activities , during the subsequent pharaohs' regions of the Third and Forth Dynasties m are also records at Sinai .